ZNC is the bouncer that I was recommended when I started, and I only have good things to say about it. On ubuntu installing ZNC is really simple. This will pull down ZNC and it’s extra modules which offer you some nice features. So now that you have ZNC installed, you need to make a configuration. You can do this with the znc --makeconf command, which I’ve pasted a session of at the bottom of this post. However, here is the config that I run now. Note: This might be from a slightly older version of ZNC, so you might have to modify this to work on the newest version of ZNC in the ubuntu 10.10 repos. Using the –makeconf option with the same answers will also make an up to date conf. The Buffer setting is the number of lines to keep in the buffer when you’re not connected. If you have your ZNC not keep your buffer, with KeepBuffer = false setting, I tend to keep the Buffer setting pretty high. You don’t want to miss messages when you’re disconnected, so it will just stream these messages back to you when you reconnect. The other use of ZNC that I know people have is to connect from multiple clients, like checking IRC on an iPhone. So long as you have the MultiClients setting set, you can do this and it is transparent to anyone else in your channels. However, when you connect, you always want a scrollback of the context of the last things said. In this case, you’d want to have KeepBuffer = true, but have a small Buffer playback, so you don’t spam your phone. 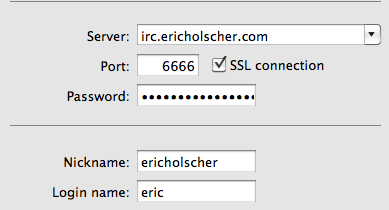 The +6666 on the Listen portion of the config means that it is listening on port 6666, using SSL. So make sure if you turn on SSL, your client is connecting with SSL as well. The modules that I have enabled are the chansaver and log modules. The chansaver module writes out your ZNC config every time you join or part a channel, so when you restart your bouncer it will have the rooms you’re in. The log module logs all the channels your in, which is nice because it allows you to have comprehensive logs of your work channels. ZNC also comes with a webadmin that I have never used, but hear is quite nice. It allows you to configure everything through a web interface. ZNC has a lot more power than I’ve shown here, including connecting to multiple backend servers, having multiple users, inter-user chat, and lots of other interesting things. Once you’ve gotten hooked, you can share your server with your friends, and play around with modules. You should then be able to just connect to that server, and your client will show all the channels you’re connected to. You can try logging off and back on a couple of minutes later and see that it plays back what you’ve missed. This really changes how you interact with IRC I find, because you can keep tabs on everything that is going on when you aren’t connected. I can be in the middle of a conversation, disconnect and move to a meeting room downstairs, and pick right back up where I’ve left off. Here is a copy of the makeconf session I talked about earlier. Where there is no visual input, it’s just me accepting the defaults. [ ** ] And 33 other (uncommon) modules. You can enable those later. [ ** ] as the irc server password like so... user:pass.